In 2005, Peter Jackson released his movie, King Kong, on December 14. Wanna know why? Because it was World Monkey Day! At least that’s what Wikipedia says—and they don’t monkey around. World Monkey Day was first celebrated on December 14, 2000. Why that day? Michigan State University student Casey Sorrow was monkeying (!) around and wrote “Monkey Day” on an unoccupied date on a friend’s calendar. When the day came around, they felt obligated to celebrate—costumes, grunting, jumping around, drinking beer (recognize that December 14 is near the end of finals at most universities, and students are no doubt in need of some reason to go ape!). The traditional continued, as Sorrow and another friend began drawing a college-based comic strip and promoted Monkey Day each year when the calendar rolled around to December 14th again. There is a serious side to all this monkey business. Primates, other than humans, are in great peril in today’s world. Primates include four major groups—monkeys themselves, along with the great apes, lemurs and tarseirs. According to the IUCN Primate Special Group, about 500 species exist today, distributed across Asia, Africa and the Neo-tropics (Central and South America). But the total number of known primate species continues to rise—91 new species have been discovered since 2000! At the same time, taxonomists are constantly revising primate taxonomy, often splitting or lumping species. These species are imperiled across their range. Again according to IUCN, approximately 70% of Asian species are endangered (IUCN categories of critically endangered, endangered and near endangered), as are about 50% of African species and 40% of neo-tropical species. Two dozen species in Asai are critically endangered, meaning that the species will probably disappear from the earth.The biggest issue for primates is habitat loss, as their forest habitats are cleared for human use (logging, agriculture and other developments). However, poaching and hunting for bush meat are constant threats as well. The humane treatment of primates is also a universal issue. The large primates—monkeys and great apes—have fascinated people in zoos and circuses and on street corners for hundreds of years. Their evolutionary ties to humans have made them useful for research of many kinds (from science to space travel). According to the Animal Welfare Institute, more than 70,000 primates are being held captive in research facilities. 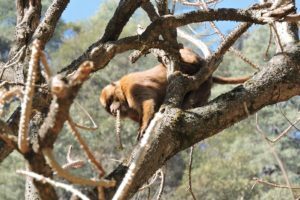 Today, however, with increasing knowledge about the complex social communities of primates, calls for eliminating use of non-human primates are continuous and widespread, particularly in Europe. Along with global feelings about the exploitation of elephants and marine mammals, it is clear that the capture, breeding and use of primates in research and for entertainment is destined to disappear. Let’s hope that wild species don’t do the same. Animal Welfare Institute. Non-human Primates. Available at: https://awionline.org/content/non-human-primates. Accessed November 30, 2018. IUCN Primate Specialist Group. An Assessment of Endangered Primates. Available at: http://www.primate-sg.org/red_list_threat_status/. Accessed November 30, 2018. Klein, Sarah. 2003. Monkeying around with the holidays. Detroit Metro Times, December 10, 2003. Available at: https://www.metrotimes.com/detroit/monkeying-around-with-the-holidays/Content?oid=2177616. Accessed November 30, 2018. Marshall, Lindsay. 2017. It’s time to stop monkeying around with harmful primate experiments. Humane Society International. 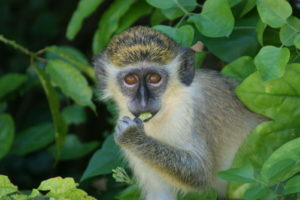 Available at: https://humanesociety.scienceblog.com/97/its-time-to-stop-monkeying-around-with-harmful-primate-experiments/. Accessed November 30, 2018. Monkeyday.com. Happy Monkey Day 2017! Available at: https://monkeyday.com/. Accessed November 30, 2018.